A Scroll Bar in Excel is what you need when you have a huge dataset and you don’t want it to hijack your entire screen’s real estate. It’s a great tool to use in an Excel Dashboard where you have to show a lot of data in a limited space. In this step-by-step tutorial, I will show you how to create a scroll bar in excel. You will also learn how to link a dataset to this dynamic scroll bar, such that when a user changes the scroll bar, the data accordingly changes. For the purpose of this tutorial, I have taken the data for 28 states in India, along with each state’s area and population (census 2001). Now, I want to create a data set that displays only 10 states at a time, and when the user changes the scroll bar, the data dynamically changes. The first step is to get your data in place. For the purpose of this post, I have used census 2001 data of 28 Indian States with its Area and Population. Go to Developer Tab –> Insert –> Scroll Bar (Form Control). If you can’t find the developer tab in the ribbon, it is because it has not been enabled. By default, it’s hidden in Excel. You first need to add the developer tab in the ribbon. 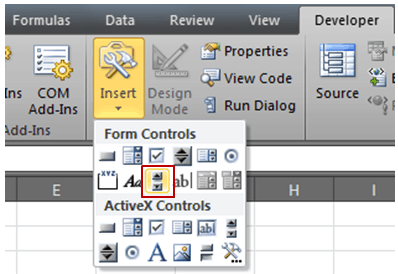 Click on Scroll Bar (Form Control) button and click anywhere on your worksheet. This will insert a Scroll Bar in the excel worksheet. Right click on the Scroll Bar and click on ‘Format Control’. 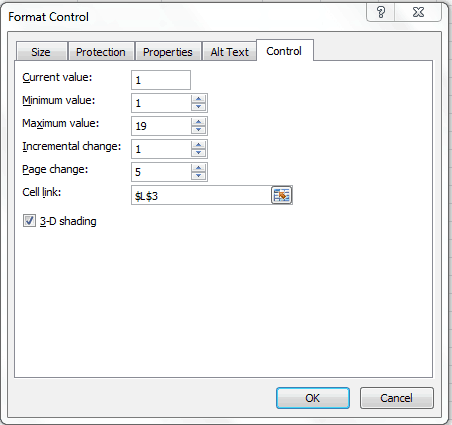 This will open a Format Control dialog box. $L$3 is the cell that is linked to the scroll bar in Excel. Its value varies from 1 to 19. This is the cell value that we use to make the scrollable list. Don’t worry if it doesn’t make sense as of now. Just keep reading and it will become clear!! Resize the Scroll Bar so that it fits the length of the 10 columns (this is just to give it a good look, as shown in the pic below). Note that this OFFSET formula is dependent on cell L3, which is linked to the scroll bar. Now you are all set with a Scroll Bar in Excel. The OFFSET formula uses cell C3 as the reference cell and offsets it by the values specified by cell L3. Since L3 is linked to scroll bar value, when the scrollbar value becomes 1, the formula refers to the first state name. When it becomes 2, it refers to the second state. Also, since C3 cell has not been locked, in the second row, the formula becomes =OFFSET(C4,$L$3,0) and works the same way. Create Dynamic Labels in Scroll Bar in Excel. Adjust Scroll Bar Maximum Value based on a Cell Value in Excel. 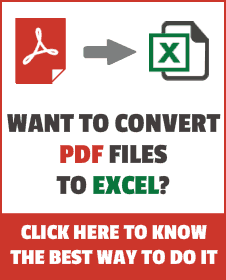 How to Insert and Use a Check Box in Excel. How to Insert and Use Checkmark and Crossmark symbols in Excel. How to Insert & Use a Radio Button in Excel. I don’t understand the Linking L3. It’s not shown in the example. Question: in my original table I have a lot of functions, dates and even drop down menus. We use this online calendar so we see who in our team will be doing what on a day. 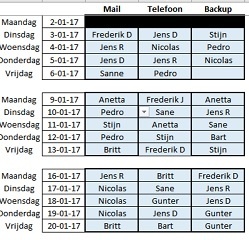 This table counts for a year (long table) and with this scroll function I’d like to keep it above in the excel so we can keep the rest of the sheet in mind. Is it possible the new scroll table takes over all functions from the original list? Hey Sumit. I came across the leave tracker which you had uploaded a couple of years back.. trust me it was just awesome. I am trying to create a similar tracker on google sheet. would you be able to help me with some tips? Hello Ashutosh.. I don’t have a similar tracker for Google Sheets but I am working on creating one. Will soon share it with you. I was unable to download the census data. Pls help me out I want to practise the work. I am very much pleased to see your work in excel vba. I have worked a lot on my worksheet but at a particular stage…I have a problem that I have a list of Months from March to February…that I want to scroll down from button ………So would you help me to set a such a button and vba code to that button that should work as I want and would you send me to bhaiswarpravin@gmail.com Please sir…….. Thank you, Sumit. This is a big help in my reports! Good Day Sumit, is there way I can use the scroll bar to page down sets of data. I have 200 graphs on a spreadsheet, I would like to only view six at a time. You can use the scroll bar to update chart based on the data that will change in the backend. 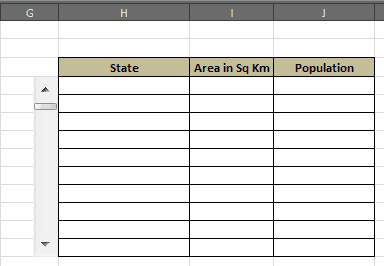 Hi Sumit, is there a way that i can add more rows to my data and the scroll bar will be able to also take in the input? but as i add on more data, is there a way that my scroll bar can detect it? Can you not have more than one scroll bar on one page? I’ve put two on one page and when you scroll one, the other one scrolls too. You can have two scroll bars and it should be linked to two different cells. When you do this, the two scroll bars would be independent of each other. Thanks for commenting.. Glad you liked it!